Mitt Romney, having deftly transitioned from failed presidential candidate to elder statesman in the Republican Party, has recorded robocalls for Ted Cruz ahead of the Utah caucuses and Arizona primary. In the recording, Romney says that Cruz is “the only candidate who can defeat Donald Trump,” and that “a vote for John Kasich is a vote for Donald Trump.” Further driving the point home, Romney confirmed via tweet that he himself will be voting for Cruz in Utah's caucuses on Tuesday. So, is Mitt Romney going to endorse Ted Cruz in the GOP primary? Not necessarily. Despite supporting Cruz in these two states, Romney isn’t a dyed-in-the-wool fan. Rather, he’s putting into motion a specific anti-Trump strategy that he outlined in a press conference earlier in the month. Romney, a committed member of the #NeverTrump crowd, proposed that Republicans should vote for whichever candidate has the best chance of beating Trump in any given state. In Utah and Arizona, that candidate is Ted Cruz, so that’s who Romney’s supporting in Utah and Arizona. Romney is a resident of Utah, so naturally, he'll be voting for Cruz there. Just a week earlier, though, Romney was campaigning with John Kasich in Ohio. That’s because Kasich, Ohio’s immensely popular governor, had the best chance of winning there. Had Marco Rubio been leading the polls in Ohio, Romney would have been campaigning for him. Ultimately, the strategy paid off: Kasich won the state and all of its 66 delegates. There are limits to this strategy, however. The biggest issue is that Trump’s campaign is based, in large part, on populist opposition to the Republican establishment and, more broadly, political elites. While Romney isn’t the precise epitome of the establishment, he’s pretty damn close to it, so it seems unlikely that his advice will hold much sway with Trump’s supporters. Furthermore, it’s going to be hard to completely erase Trump’s lead, because in some states, it’s positively yuuuuuuuge. In Arizona, he leads by an average of 13 points. The last poll of Wisconsin has him up by 10, and in his home state of New York, Trump is up by 43 (!). None of these leads are completely insurmountable, and this cycle has proved that the polls are occasionally way, way off. But in a few states, Romney’s anti-Trump strategy faces very steep uphill odds. 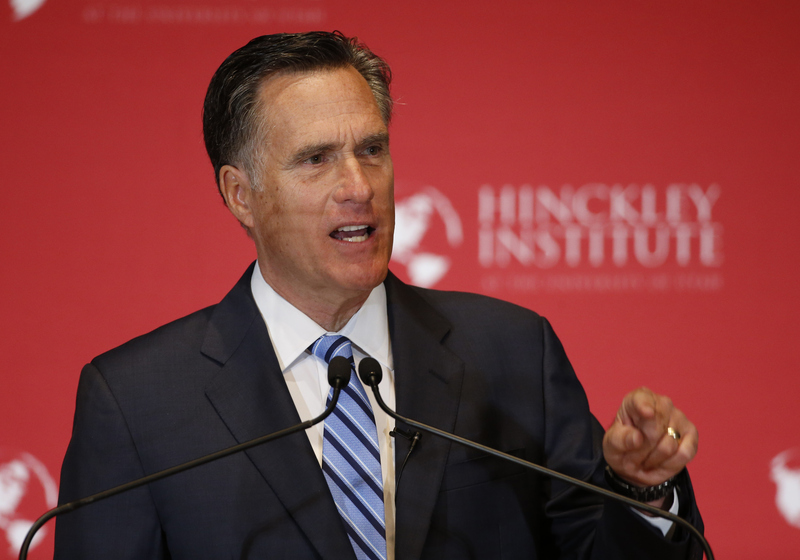 It seems unlikely that Romney will endorse a specific candidate in the Republican primary. If he was going to, he probably would have already. The much bigger question is how Romney — and the rest of the #NeverTrump Republicans — will respond if and when Trump receives the Republican Party’s nomination for president. They’ll be forced to choose between endorsing a man they loathe, endorsing a Democrat, or sitting the election out entirely. If you're a card-carrying member of the Republican Party, none of those options are very appealing.